The best thing to be said about it was…it was a win and no one got hurt. 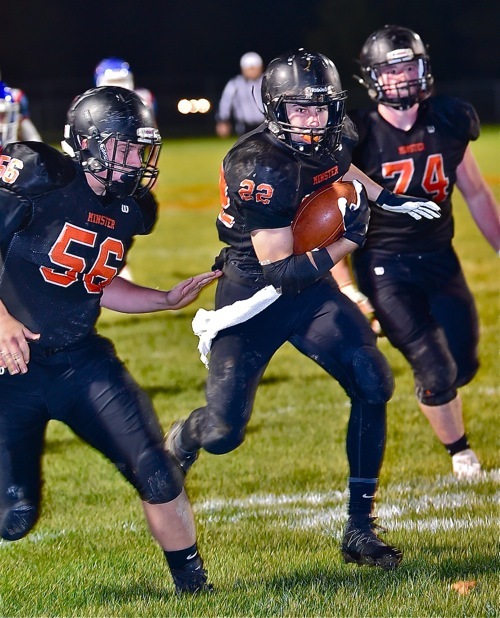 Minster sunk the Riverside Pirates without much of a fight in their Division VII playoff opener. Minster – It’s hard to explain, really. Teams play ten regular season games, and you spend all that time obsessing about computer points, and strength of opponents, to determine the best matchups and seeding for first round playoff games. 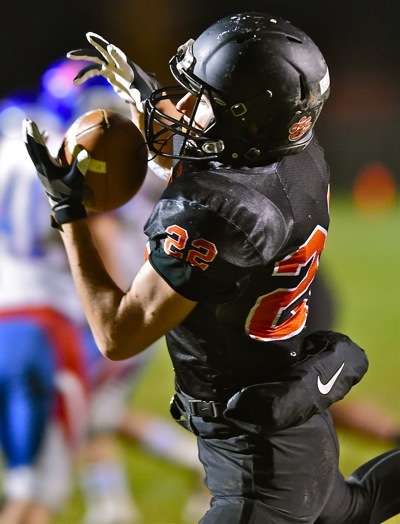 And then…a spate of first round ransackings, the likes of what was seen Friday with Marion Local, St. Henry, Troy, LCC, and Coldwater; and Saturday night, in Division VII, Minster joined that party with a 51-6 cruise past the outmanned Riverside Pirates, the 5th seed in Region 28. So complete was the win that Riverside could account for only 20 yards in the first half, and had no first downs. This, while Minster was racking up 17 first downs, 37 points, and a whopping 337 yards on 37 plays. That was for the half, mind you. 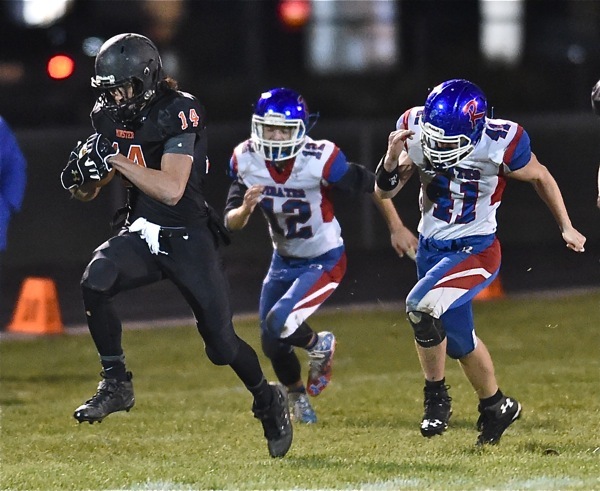 And then, the Minster seconds, with senior running back Broc Miller rushing for 108 yards and two touchdowns, added the final fourteen points in the second half while the clock ran continuously, and a good thing. You got the impression that Minster could have scored another 37 with conventional timing. 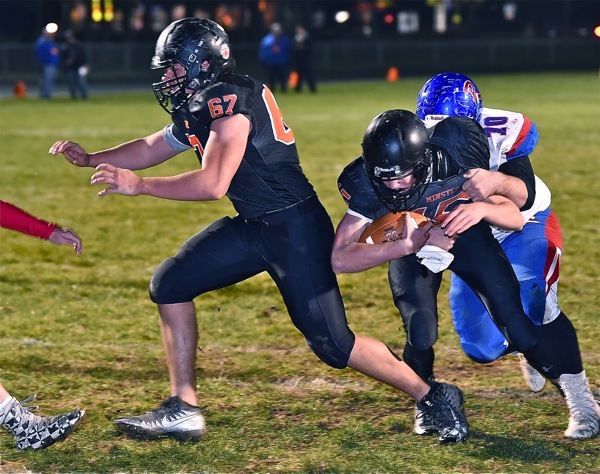 It amounted to what’s become post-season business as usual for the 8-3 Wildcats, who won their sixth consecutive playoff game, dating back to last year’s 5-0 record and the Division VII title. And in the end Geron Stokes gave his usual hearty pep talk…cautioned his kids about doing foolish things over the weekend, about leaving mud on the locker room floor, and finished with the challenge to get better immediately, starting Monday. Better than 51-6? Well pity Convoy Crestview, Minster’s second round opponent next Saturday night! Alex Schmitmeyer grabs a touchdown pass from Jacob Niemeyer that started the scoring in the first quarter. That said, they fed sumptuously on the Riverside Pirates, while leaving their frigate in shambles. And out of respect, no one laid a hand on the team bus…just the team boat! It began with a 19-yard TD pass from Jacob Niemeyer to Alex Schmitmeyer at 7:58 of the first quarter. It continued with a 2-yard run by Schmitmeyer two minutes later, after a Riverside punt. Three minutes later, after another change of possession, Niemeyer ran it in himself from four yards out. Five minutes into the second quarter Cody Frericks scored on a 21-yard pass from Niemeyer. Then Schmitmeyer followed with his third touchdown of the game, a 45-yard catch and run from Niemeyer two minutes before the half to make the score 37-0. You get the idea by this time, or you should. #4 seeds playing #5 seeds are usually a better match than this, but NOT this match. The numbers don’t lie. Broc Miller continued the onslaught with a 14-yard run to score at 5:30 of the third quarter; and then capped his 108 yards of rushing in the second half with another 1-yard plunge in the fourth quarter to mercifully end things…all except for the Pirates lone score, a 6-yard run by Kale Long with 15 seconds remaining the game. As for the numbers telling the truth? Minster finished the night with 218 passing yards, and 227 rushing yards, for a total of 445, and this with a running clock for the entire second half. And Alex Schmitmeyer scores the third of his three first half touchdowns on a 45 yard catch-and-run from Jacob Niemeyer. Riverside finished the game with 113 rushing yards, and 23 passing yards, for a total of 136. And one final irony. Teams that dominate time of possession usually win the game. But on the night Riverside held the ball almost twice as long as Minster (29 minutes to 19), and still lost by 45 points. It wasn’t as much as Geron Stokes would have like from a first round game, but as he explained…the Wildcats met their pre-determined standard set before the game. And post-season business as usual, going back to the same words, the same standard, and the same level of efficiency from last year’s playoff run. And next week, presumably a better opponent with Crestview, a team that fought bitterly against Minster before falling the second round of last year’s tournament. “It should be a fun week,” deadpanned Stokes as he concluded his words. Business as usual, as the MAC concluded first round play with a record of 4-1. Austin Browns sets sail with a first half kick return with a couple of Pirates in his wake.